• Transportation with volume discount a case study of multi-plan limited, by Abdul-Salam Sibidoo Mubashiru* [paper in English]. • Measurement of a cost function for US airlines: restricted and unrestricted translog models, by William J. Meland* [paper in English]. • A merger effect on different airline groups: empirical study on the Delta-Northwest merger in 2008, by Sora Park* [paper in English]. • Risk perception factors and their influence on road transportation, by Aderinlewo Olufikayo*, Ata Grace [paper in English]. • Informal transport and its effects in the developing world - a case study of Addis Ababa, Ethiopia, by Fekadu Kassa* [paper in English]. • A spinoffs study applied to the airline industry, by Erika Kutscher* [paper in English]. • Analysis of rail yard and terminal performances, by Marin Marinov*, Leonardo Di Giovanni, Giulia Bellisai, Julian Clevermann, Anastasia Mastellou, Diogo Victόria, Lalka Deleva [paper in English]. • Monitoring the condition of roads pavement surfaces: proposal of methodology using hyperspectral images, by Marcos Ribeiro Resende, Liedi Legi Bariani Bernucci, José Alberto Quintanilha* [paper in English]. • A model to predict cracks progression in hot-mix asphalt pavements, by Sérgio Pacífico Soncim*, José Leomar Fernandes Junior [paper in Spanish]. • Urban mobility in Maputo metropolitan area: analysis of the management bodies of urban planning and mobility, institutional arrangements and inputs for effective articulation, by Inocêncio Nhatuguês de Mendonça* [paper in Portuguese]. 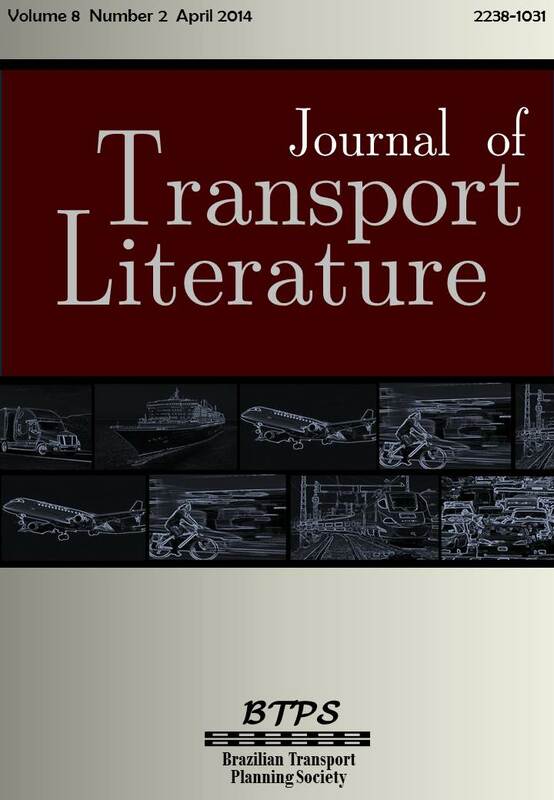 • Hyperpath concept in freight transport: an exploratory analysis, by Silvia Araujo dos Reis*, José Eugênio Leal [paper in Portuguese]. • Modeling of logistic networks with seasonality: influence of carrying cost and ICMS credit, by Ricardo Hamad*, Nicolau Dionísio Fares Gualda [paper in Portuguese]. • Improving post-sale reverse logistics in department stores: a Brazilian case study, by Diana Mery Messias Lopes, Márcio de Almeida D'Agosto, Amanda Fernandes Ferreira*, Cintia Machado de Oliveira [paper in English].